How to Convert iTunes Rented Movie for keep on iPhone 5S? Is it possible to keep the iTunes rented movie on iPhone 5S? "I have been looking forward to the new iPhone 5S for a long time and I really want to buy one as soon as it is announced. But I wonder if there is any way to keep the movies rented from iTunes on iPhone 5S. I usually rent a collection of movies at one time, but I don't have enough time to watch all of them before the period of validity. What I need is to watch the rented movie on iPhone 5S whenever I am out of work." If you are one of the Apple fans who have been waiting for the new iPhone for nearly the whole year, you will be happy to know that the date of the Apples's next event has been confirmed. 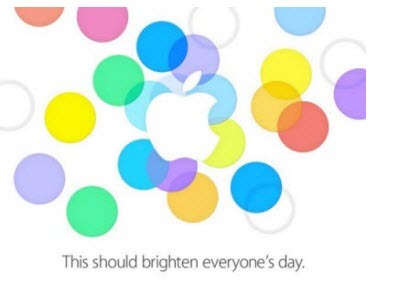 On Sept. 10, Apple is going to hold an event in San Francisco. Though Apple didn't reveal whether it will release the new iPhone on the event or not, we still believe the new iPhone 5S will appear together with another brand new iPhone 5C according to the reliable information divulged before. The iPhone 5S has been said to have a similar design to the iPhone 5, but with a new fingerprint sensor embedded near the circular home button. The feature would add to the security of the phone. In addition, the iPhone 5S reportedly has a faster processor, improved camera and will be available in a new champagne or goldish color. Though iPhone 5S natively supports iTunes rented movie playback which acts the same as its previous iPhone series, the iTunes rentals can't be kept for a long time on your iPhone 5S. The rented movie from iTunes is only available within 30 days, and you must finish watching the movie in 24 hours when you click to start to play the movie on iTunes. The best way for you to keep iTunes rentals on iPhone 5S is to unlock iTunes DRM rented movies and convert iTunes M4V rentals to common video formats for syncing to iPhone 5S. NoteBurner M4V Converter Plus for Windows is a top iTunes rental video converter on Windows platform. It is a wonderful iTunes DRM removal tool which helps you remove DRM from iTunes M4V rentals and purchases and converts them into various video formats like MP4, MOV, AVI, MPEG and etc for playing on iPhone 5, iPhone 5S, Android devices, Windows Phone 8 devices and Windows RT tablets. 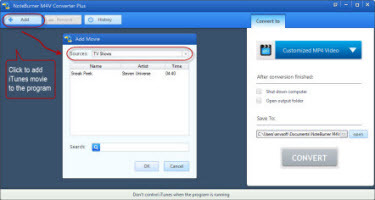 Launch NoteBurner iTunes rental video converter and click the add button on the main interface. Then choose the M4V rentals you want to keep on iPhone 5S from iTunes library. To convert DRM iTunes rentals to iPhone 5S, you need choose a compatible output format for transfering to iPhone 5S. You are recommended to click the output format bar and then choose Customized MP4 movie video from the submenu. Since we recommend you use Customized MP4 profile, we also need to adjust the video and audio parameters for playing on iPhone 5S. Video Size should be changed into 1280*720 and video bitrate is suggest to be turned into 2000K. Thus, you can start to convert iTunes M4V rental to iPhone 5S conversion with best settings by clicking on the Start button. Finally, when the program finishes the conversion, you can click locate button to open the output folder to get the converted movies with high video and audio quality. You can freely launch iTunes and sync the converted movies to the iPhone 5S after connecting the iPhone 5S to computer with the USB cable. Now, you can keep the iTunes rentals on your iPhone 5S forever with simple steps. How to Keep iTunes Rentals Forever on iPad Air?